On November 30, we commemorate the birth of the one and only “Jazzologist Supreme,” the eccentric clarinetist Boyd Senter. Boyd Senter was born on November 30, 1898 on a farm in Nebraska. Much like his contemporary Bix Beiderbecke, he was inspired to play jazz after hearing a record by the Original Dixieland Jazz Band. Like many budding jazzmen, he took up the saxophone and clarinet, and also became proficient on trumpet and banjo. Senter built his reputation on his novelty clarinet playing, and came to be known as the “Jazzologist Supreme.” His first session was with Jelly Roll Morton’s Steamboat Four/Stomp Kings/Jazz Kids, which, despite bearing his name, did not feature Jelly Roll Morton. In 1924, Senter made a number of records at Orlando B. Marsh’s Chicago-based recording laboratories, where some of the earliest electrically recorded discs were being cut. Following the Marsh recordings, Senter made a series of sides for Pathé before moving to Okeh in 1927, where he was frequently accompanied by Eddie Lang on guitar. On one session, a redo of his “Mobile Blues”, originally recorded for Marsh, everyone in the studio was reportedly so drunk that the recording was rejected (it was released in Europe, though). The next year he formed a jazz band dubbed the Senterpedes, which often included the talents of the Dorsey Brothers, Phil Napoleon, and Vic Berton. Senter and his Senterpedes moved to Victor in 1929, and among other titles, cut a jazz version of Jimmie Rodgers’ “In the Jailhouse Now”. Senter made his last recordings in Hollywood for Victor in 1930, and continued to play jazz in Detroit until the end of the Swing era, after which he turned to a life of selling sporting goods. Boyd Senter died in Oscoda, Michigan in June of 1982. Paramount 20364 was recorded in October of 1924 by Marsh Laboratories in Chicago, Illinois, among the earliest electrical recordings made. Boyd Senter switches between clarinet, alto saxophone, and trumpet, and is accompanied by Jack Russell on piano and Russell Senter on drums. First, the Jazzologist Supreme stomps through the raggy “Fat Mamma Blues”. 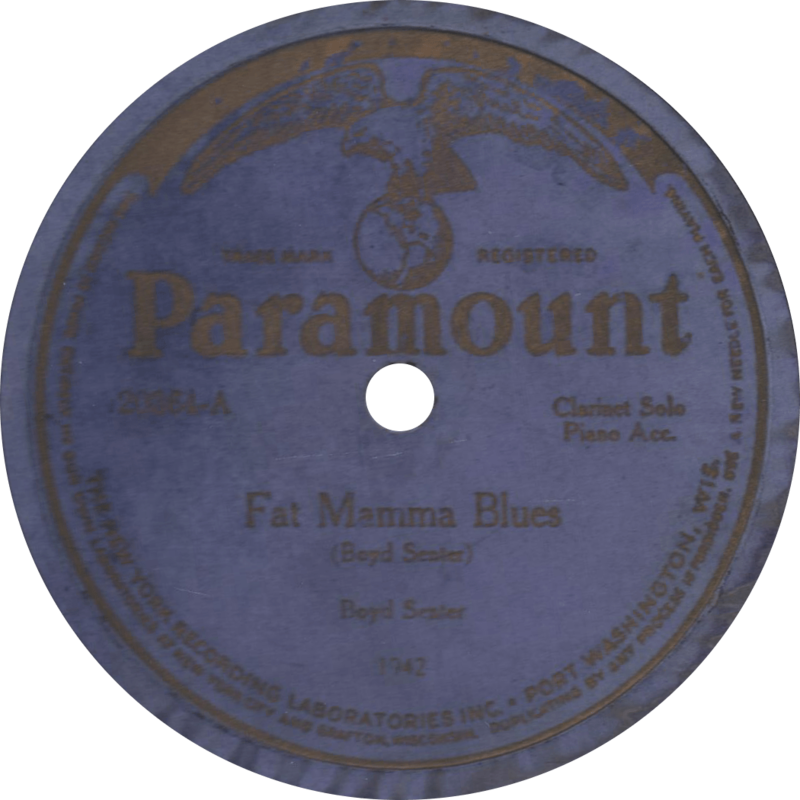 Fat Mamma Blues, recorded October 1924 by Boyd Senter. Another of his own compositions, Senter next plays “Gin Houn’ Blues”. 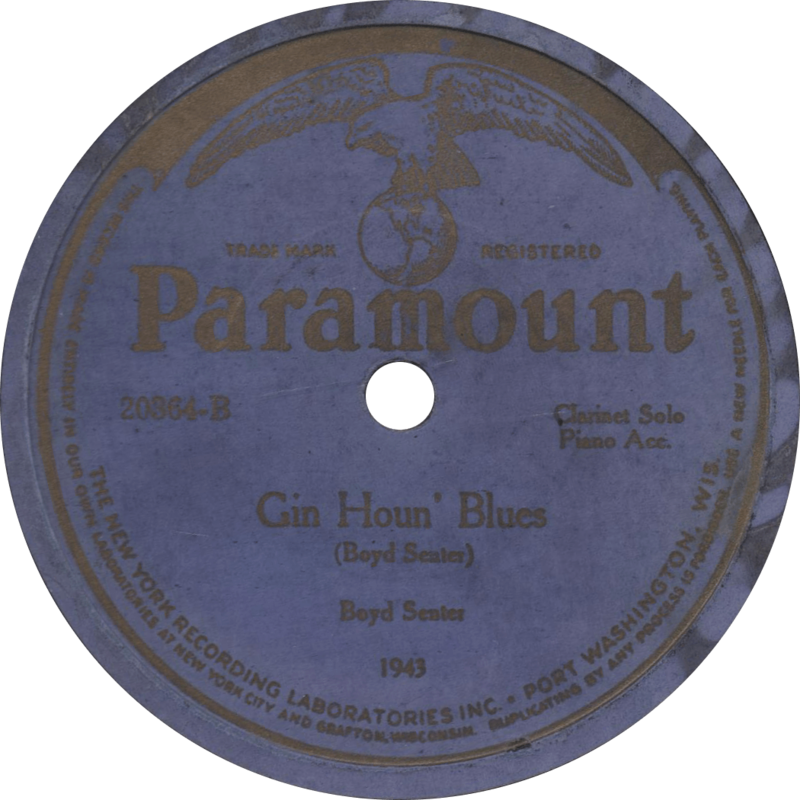 Gin Houn’ Blues, recorded October 1924 by Boyd Senter. This entry was posted in Records and tagged 1920s, 1924, Boyd Senter, Chicago, Jack Russell, Jazz, Marsh Labs, NYRL, Paramount, Russell Senter by R. Connor Montgomery. Bookmark the permalink.